Attached to name Shaniqua lingers a stigma. Ever notice when most comedians want to refer to a ghetto girl they use the name “Shaniqua” and when referring to a ghetto white girl the common name to usage is “Becky”? There are many stereotypical characteristics associated with a name. 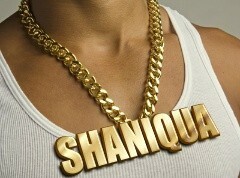 In the minds of those who stereotype there is an unfortunate demeaning picture painted, for example: Shaniqua has an articulation deficiency, a bad attitude, exaggerates neck swirling, booty pops like her previous profession was stripping, dwells upon roach infestation in the heart of the “Hood”, lacks the required education necessary to excel to higher grounds, most likely wears gold teeth, gelled hair, ridiculously long nail extensions and has plenty kids to start up her own nursery. For a long time I contemplated changing my name to refrain from being singled out and misconstrued. However it’s the name that has been with me since my existence. Shaniqua is also the name my family and friends know to be attached to the very person they have grown to love and the name my mom selected over “Jersey”. I say that, to say this…if we allow people to define who we are because of a shallow misconception then we become the stereotype. Who am I? I am a humble American girl named Shaniqua Moore and I am defined by no one. Previous PostCOMING SOON…Next PostWho Said You Can’t Mix Business with Pleasure?